Science methods and techniques :: chromatography. Science Methods and Techniques – Chromatography. Separation of individual chemical compounds from the mixture is a very common task in the process of scientific experiment. You deal with similar compounds and you need to figure out what is in the mixture. Chromatography is one of the science methods and techniques used to address this issue. It can be used to separate liquid or soluble compounds which have very similar properties and can not be extracted or separated by other methods. To understand how chromatography works imagine group of people of similar fitness. They should carry weights along the road starting at the same place. They all take off at the same time and walk with approximately the same speed. All weights have identical look but actually they made of different alloys. Let's say half of them are 20kg weight (~44 lb) and half - 40kg. Each person takes the weight and walks with it. Persons with heavier weights will need to take a rest more frequently and perhaps rest longer then those who carry lighter weights. Pretty soon our carriers and our weights will be separated in two groups. Something similar happens during the chromatography process. In our example people who carried the weights were what in chromatography called mobile phase. The roadside where they would take the rest was stationary phase. And weights were our chemical compounds. Bunch of different weights at the start line was analyte. And the weight and gravity force worked as affinity between chemical compound and stationary phase. We forget to tell that at the start there were more people then weights, so some lucky went off with empty hands. They would travel further then all others. This would be our solvent front. One important term in chromatography that you need to understand is Retention Factor. Retention factor is a value that helps to identify same chemical compounds on different chromatograms. This problem may occur where we compare different samples on different chromatograms(for example plant pigments extracted from different species of plant). 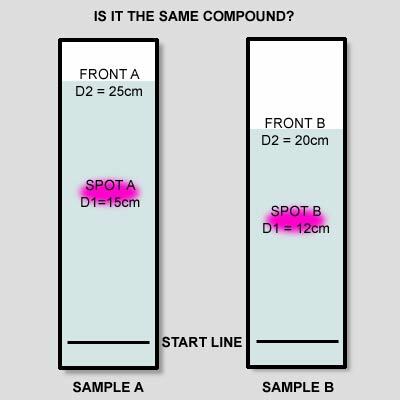 It's calculated as a simple ratio: Rf = D2/D1, where D1 is the distance our compound traveled from the start line and D2 is the distance of the solvent front from the start line. For the same compound running on the same stationary phase with same solvent this ratio will always be the same! Note: D1 is always measured for the center of the measured spot.Let's look at the example picture below. For sample A D1 = 15 cm and D2 = 25 cm. Rf = 15/25 = 0.6. For sample B D1 = 12 cm and D2 = 20 cm. Rf = 12/20 = 0.6. Conclusion? The compound is the same for both chromatograms. paper chromatography is probably the simpliest science method you could try at home. Scientists are using many types of chromatography but we'll stick with TLC and paper. For paper chromatography as it follows from its name, paper used as the stationary phase. TLC – stays for Thin Layer Chromatography. This method is similar to the paper chromatography. Starch, chalk or silika-gel used as a stationary phase in TLC. We'll explain how to prepare TLC plates at home and what you may expect to be able to separate on those plates. Mobile phase is very important. If you choose wrong solvent your analyte would not separate or would not even move so your experiment will fail. In our analogy(mentioned above) if people are not fit enough they would not be able to carry weights at all. Or if they are professional athletes they might be able to carry all weights from start to finish at the same pace, so all weights will arrive at the same time! Solvents have important quality called polarity. This quality determines how solvent will bond with analyte compounds. On the other side of equation is the polarity of the stationary phase. Scientists frequently use systems of solvents – mixture of two or more solvents in different proportions to get the best possible separation. It usually require few tests to chose ideal solvent proportions. There are only few materials you can use at home as a stationary phase. It's paper, starch and chalk. Learn how to do paper chromatography at home. Learn how to prepare TLC plates at home. Check our TLC chromatograpy experiment at home.